“Surely we have killed THE MESSIAH [al-Masih], Isa the Son of Marium, THE MESSENGER of Allah” (S. 4:157). If, as Ehrman pointed out, Josephus would not have identified Jesus as the Christ, for which reason the Testimonium Flavianum must be seen as a corruption, then it follows that the Qur'an is either wrong when it puts such words in the mouth of the Jews or the Qur'an has been corrupted. QED. Sorry to ask , but is PW still a muslim? I've lost track. Let's assume that this wasn't an interpolation by Christians (which just about every major scholar including Christian scholars does think it was) was difference does it make? A man born around 37CE who around about activities which Christians claims to have occured around 33CE and the writings were made around 92 or 93CE . They are NOT eye witness accounts . They are not written about an observable event of the character , Jesus. If it were true , all it is , is the stating of a non-christian of what he was observing 60 years after an event he was not a witness to. In a court of law it would not stand up as evidence. Thank you Anthony. It seems to me that it does not end there. Josephus confirms the crucifixion of Jesus which proves the writer of the koran was a liar or ignoramus. Why misrepresent what main stream scholars believe . Only a handful of conservative evangelicals believe this piece to have any element of legitimacy to it. More importantly , 3 extremely well known scribes who should have written about Jesus didn't , seeing that they were contemporaries to Jesus. In fact if you do you homework you will realise that Philo , a Jewish philosopher influenced Christianity between 20CE and 30CE . When you type in the word logos Christianity meaning on Google you get this definition :In Christology, Logos (Greek: Λόγος logos, that is, "word", "discourse" or "reason" i.e., rationality or reasoning) is a name or title of Jesus Christ, seen as the pre-existent Second Person of God according to the doctrine of the Trinity. 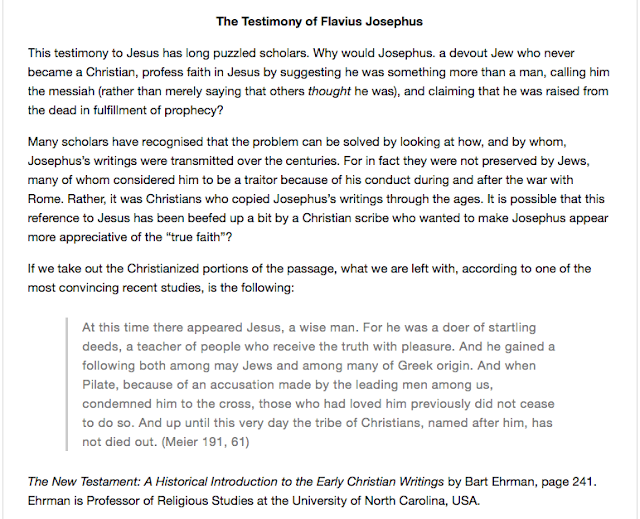 It takes more effort to extract what the potential true meaning behind Testimonium Flavianum than it does to see the connection between Philo's writing and the Christian doctrine of who Jesus is. Hey, that's actually pretty solid reasoning. Cheers! In the Gospels the Jews call Jesus the King of the Jews since Jews don't believe this then the Gospels must be wrong and these words must been put into the mouths of the Jews. These are not my standard but if you are going to be consistent then you would have to say the same thing about the Gospels. BTW, scroll down to part II for the relevant section.